​Anuradha is deeply engaged with Prerak Trust, using her extensive experience in change management and strategy in evolving programs. She is also on the Board of Raindrops Foundation, which makes quality medical care available to underprivileged children. Earlier, she served as a member of the Board of Trustees at Arghyam, a Foundation for Water and Sanitation. She has been advising several software organizations on Change Management. She has extensive training experience on Project Management and Systems. 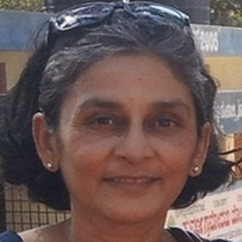 Anuradha was part of the strategy team of Bangalore Agenda Task Force. She spearheaded the Offshore Development Architecture and Process Management initiatives at Infosys Technologies. Anuradha holds a Master's degree in Mathematics from Bombay University and a degree in Engineering from ENSEEIH, Toulouse, France.